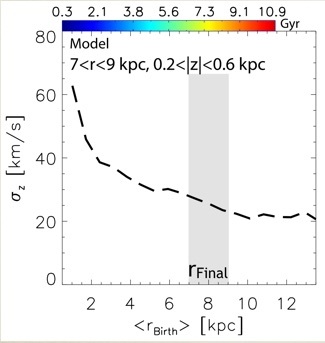 Vertical stellar velocity dispersion as function of distance from the galactic radius. The red and blue vertical lines indicate the positions of the corotation and Outer Lindblad resonance of the central bar (from Minchev et al. 2012b). The simple numerical experiment shown here reveals how much migrating stars contribute to the disk thickness with time seen in N-body simulations. Plotting the velocity dispersion for each of the above-defined populations yields the three curves in the top panel. It can be seen that star coming from the inner disk arrive slightly hotter than the non-migrators, while the inward migrators cool the disk slightly. In the bottom row of the figure we can see the TOTAL effect of the migration, where all migrators are put together. Their resulting velocity dispersion radial profile is mostly indistinguishable from that of the stars which did not migrate. This simple test indicates that migration does not contribute to the disk thickening to any significant effect, except in the outer disk, where extreme outward migrators induce some flaring. Similarly, extreme inward migrators result in disk contraction in the disk center (it can be seen in the bottom panel that the green solid curve lies below the black one). That radial migration is ineffective in thickening disks has been confirmed by Martig, Minchev, and Flynn (2013), but also by other research groups: Vera-Ciro et al. (2014) and Grand et al. (2015, in preparation). •Stars migrate (change guiding radii) slower than vertical and epicyclic oscillations. In other words, to preserve vertical action outward migrating stellar samples must decrease their vertical energy (or vertical velocity dispersion) exponentially with radius. This causes stars to arrive at an outer radius with a velocity dispersion (and thus thickness) similar to that of the local (or non-migrating) population. 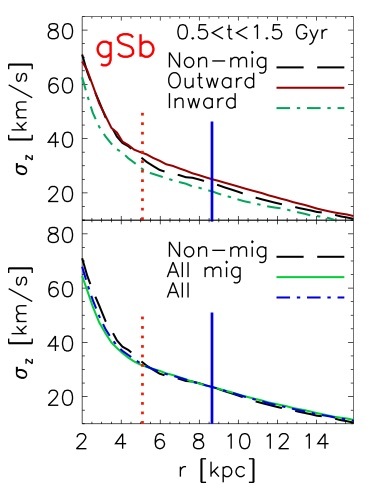 It can be easily seen that if the population in the outer disk were heated by orbiting satellites (as is the case in a cosmological context), then the outward migrators will arrive RELATIVELY COOLER than the population originating in the outer disk. This is shown below. Vertical velocity dispersion of stars currently in the simulated solar neighborhood (grey vertical strip centered on 8 kpc) plotted against stellar birth radius. 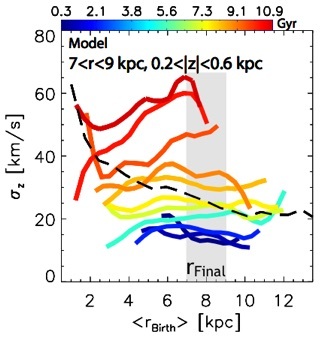 Naively, it can be inferred from this plot that stars born in the inner disk constitute the hottest population at the solar radius today (from Minchev et al. 2013). Colored curves indicate mono-age populations (stars grouped by common age). One can see that, for a given age group, stars arriving from the inner disk are cooler (have lower velocity dispersion) than stars born close to the solar radius. This is related to the effect of infalling satellites, which affect more strongly the outer disk (induce disk flaring), because of the low disk surface density there. 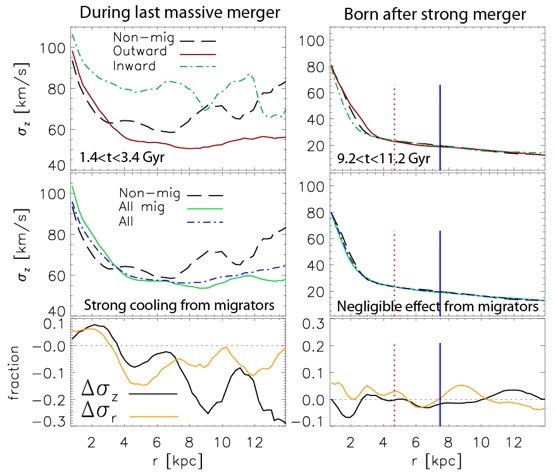 As mergers become less frequent and less massive at later times (orange line, ~8 Gyr old), the positive slope flattens and eventually becomes slightly negative (blue lines, ~2 Gyr old), suggesting that in the absence of mergers stars migrating outwards arrive slightly hotter than the local population. Note, however, that this does not mean that migration thickens the disk, since stars coming from the outer disk (inward migrators) cool the disk and thus cancel the effect of outward migrators (see Minchev et al. 2012b).